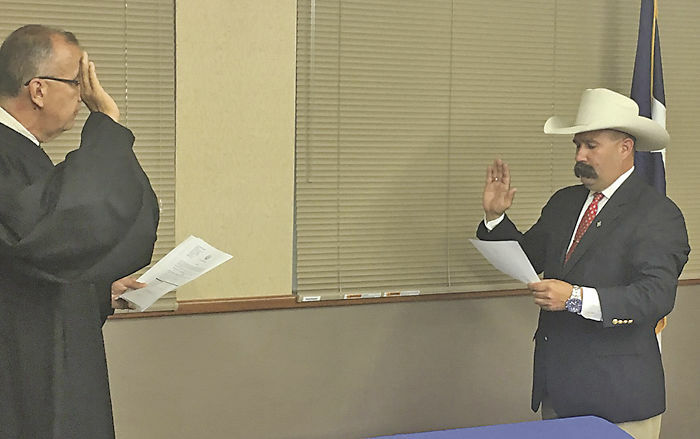 Jorge Alvarez Jr., right, is sworn in as a member of the hospital board by county Court-at-law Judge Romero Molina on Thursday in Rio Grande City. RIO GRANDE CITY — A new board member was welcomed onto the Starr County Memorial Hospital board Thursday evening, filling the seat of Joel Saenz who died in June. Jorge Alvarez Jr., a ranch manager from La Gloria in the northern part of the county, will finish out Saenz’s term as board member for Precinct 4. The selection of Alvarez, 38, was done at the behest of Saenz himself. Shortly before his passing on June 13, Saenz authored a letter to the board urging them to select Alvarez. Hospital CEO Thalia Muñoz read the letter to the board before the vote on the appointment took place — a letter which he had dictated to his wife over three days due to his deteriorating health. Saenz wrote that in 2016 he had met with Alvarez who was under the mistaken impression that Saenz did not intend to run for re-election and was interested in running for the position himself. Saenz clarified he was seeking another term on the hospital board and said that if Alvarez, who did not wish to run against him, was still interested in serving on the board in 2020, Saenz would support him as he would not be seeking re-election that year, according to the letter. Weeks before writing the letter, Saenz said, he reached out to Alvarez to gauge whether he was still interested, to which Alvarez indicated he was. He added that if there was more than one person seeking the position, his letter would take the responsibility of choosing off of the other board members.